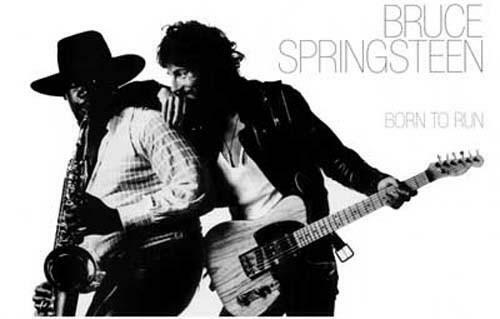 Born to Run in the U.S.A.
What can anyone say about this album that probably hasn’t been said a million times before? I mean, it is a transcendent slice of American rock ‘n’ roll that made rock ‘n’ roll fun again without losing any punch as to the stories it told. The album’s tales nearly burst from exuberance and hope. The young and disenfranchised protagonists still believe they will, as the title track puts it, “get out while [they’re] young,” and will enjoy themselves along the way. Well, how about saying Born to Run is a forgotten classic? This may strike many as a weird statement considering the long shadow that The Boss has extended over the American rock landscape in his 47 years (as the very first version of the E Street Band – known then as the Bruce Springsteen Band – was formed in 1971). Yet this characterization really is apropos because while familiar with individual tracks in some form, usually a live version, many haven’t listened to the original album at all or in the manner it was meant to be listened to at the time of its release. In 1975, the full length album was meant to be a total experience, over and above any tunes that might get cut from it to play as singles. Often the album versions of songs varied in length or composition because the album was for the musician and lovers of music while the single was for the radio and the casual listener. Further, there was no easy way to change the artist’s presentation of his or her music. Tape recorders – which would have made it possible to reorder the album – were only just making headway in the market but had not yet become dominant as they would only a few years later when punk broke in the U.S. Only DJ’s had the equipment to mix songs but these (just emerging) hip-hop techniques were still found only in the ghettos of New York City, cultivated by an audience that completely eschewed the kind of music Springsteen played. Singles – with their radio-friendly edits and B-sides – were about the only way to listen to an album in a different way other than to go to a concert. What is so striking about Born to Run is that it feels like you are listening to a live band. No, not the kind of cheesy live albums with canned crowd noise that would make Kiss famous. Born to Run definitely has some studio polish with music business veterans Mike Appel and Jon Landau behind the boards but they so well capture the energy of the road-tested E Street band that this album seems as if it’s being played right in front of you, and by a much faster, louder band. After all, the album mostly sticks to mid-tempo songs! So, no one in the 33 1/3 series – which I highly recommend for music fans with time constraints – has written on Born to Run (yet). 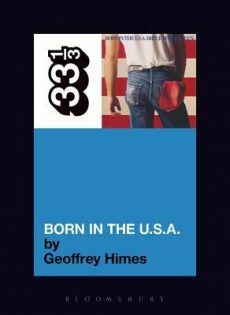 But Geoffrey Himes, music critic for a number of publications but particularly the Washington Post, did pen a really interesting look at the writing process and production of Springsteen’s 1984 classic, Born in the U.S.A. Born in the U.S.A., much like Born to Run, captures its own time period in a striking way. However, we find similar characters to those on Born to Run, years older and much more jaded, looking for some kind of recognition that their wild dreams of youth have been endangered by the economic shifts that struck American industry and towns in the late 70’s and early 80’s. This entry was posted in Reviews and tagged Bruce Springsteen, Music Journalism, Rock Albums, Tony on April 18, 2018 by Tony.